Bast, also known as Bastet or Basthet, just in general as the “Cat Goddess”, was not only known as the Egyptian Goddess of sensual pleasure, but also as protector of the household, bringer of health, and the guardian of firefighters. 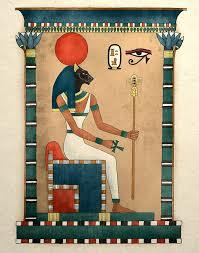 Bast is the daughter of Ra, the sun god, and is one of the few sun goddesses that is also recognized as a moon goddess. The following legend will reveal how she earned such a distinction. As it was told, by day Bast would ride through the sky with her father Ra, in his boat pulling the sun across the sky. She was ever watchful and protected Ra from his enemies, causing her to become known as the Lady of the East, Goddess of the rising sun, and the Sacred and All-Seeing Eye. At night however Bast transformed herself into a cat, renown for it’s superb night vision, in order to better guard her father from Apep, a serpent who was his greatest enemy. Ra’s priests burned wax models of the snake, writing his name in green ink in an attempt to hex him, but to no avail. Finally with her cat eyes shining in the dark, it was Bast who killed her fathers enemy. Credited with killing Apep, Bast ensured the sun’s warmth would continue to bless the delta of the Nile with fertile soil and abundant crops, which resulted in her also being honored as a fertility goddess. Because of her all-seeing sacred eye, called the utchat, that magically saw through the dark, she was also classified as a moon goddess, her glowing cat’s eyes reminding us of the moon that it reflects. The worship of Bast began around 3,500 B.C.E., before the invention of writing. In 950 B.C.E. it became the ‘national religion’ when her hometown of Baubastis, became the capitol of Egypt. A shrine to her was built in Baubastis, fashioned from blocks of pink granite and a lengthy entrance lined with enormous trees. Her shrine was considered to be one of the most beautiful temples in the world. Cats were honored in her temple and the grounds held an extensive cat cemetery, numbering over 300,000, where her beloved companions after being mummified, were entombed so they could join her in the spirit world. Cats were honored in the temple of Bast and many felines were in permanent residence there in life. If a local house caught fire, the cats would be dispatched to run into the flames, drawing them out of the building. History’s first recorded fire brigade! Many of the cat’s returned to the temple, sometimes slightly injured, but considered as heroes of the townspeople. Any unfortunate cat who perished in the fire would be restored to life by Bast, possibly becoming the source of the belief that cats had nine lives. 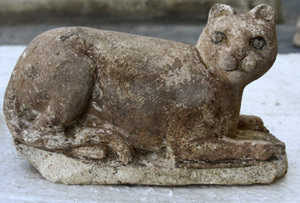 Most households contained a small statue of Bast as a form of household protection, The All-Seeing Eye, to ward off thieves, and as the Cat Goddess, to keep the house free of snakes, and as the healer to ward off infectious disease. An amulet of the utchat (all-seeing eye) hung over a door deterred thieves and vandals, placed over the mantel it averted illness, worn around the neck it protected you as you traveled. Bast, more than any of the Egyptian goddesses, was considered a protector and friend of women and young children it is thought that this lead to her being referred to as “The Egyptian artemis”. 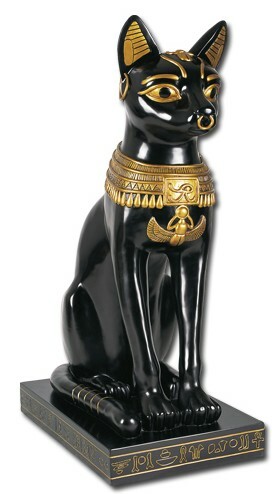 The Egyptian goddess Bast reminds us of all that is feline and feminine. Her gifts, very cat-like in nature, include the refusal to be at everyone’s beck and call, and an insistence on the freedom of expression. Most importantly, Bast leads us to accept the true nature of things (ourselves included) and helps us remain unswayed by the opinion of others. I come from a family of Witches, and in our Familial Tradition Bast also represents strength and independence, leading to the phrase “She is a Bast woman”. I think it is a high compliment indeed. General: Cats, rising sun, utchat (the “All-Seeing Eye”, pottery jars as perfume holders, beer, music and dance. Additional information: A team of Archaeologists recently unearthed a temple dedicated to Bast near Alexandria, finding a large collection of pots and statues of Egyptian Gods as well, including a statue of Bast (picture included). The Supreme Council of Antiquities, states that this indicates that the goddess Bast was worshiped much later than originally thought. Do you ever find yourself thinking about how you would rather be lounging around somewhere else, engaging in something luxurious? Bast would always and forever encourage you to do so. She is the Egyptian cat Goddess of passion, pleasure,and the sun to name just a few. She loves to dance, and remembers to never take things too seriously. Who wouldn’t want her around? Especially if she can help you with love issues as well as self doubt obstacles. She has that special nocturnal cat vision, that allows her all seeing eyes to see through the darkness in physical circumstances and emotional ones, so we can become our true selves. Bast herself is one strong and loving personality, which attracted her many followers. She was worshiped around 3,000 B.C.E, and was known for her protectiveness of households and of women. Her worshipers of Ancient Egypt attended her shrine in Baubastis, that was made of pink granite and was considered to be one of the most beautiful temples in the world. The temple grounds also held Bast’s cat followers who were mummified within the cemetery in her honor. When she wasn’t being worshiped for the exquisite goddess she is, she would ride with her father Ra, the sun god, in his chariot to pull the sun across the sky. She lived a life of ease and luxury, but always made sure to help her fellow Egyptians by giving them fertile crops to plant, and water to fill the rivers. So in this case she is also a fertility goddess. With all these attributes, also came her addiction to love. This wasn’t a negative addiction, mind you, but Bast had a way with both men and women. She had many lovers and affairs, all involving her special ingredient of seductive passion. A very playful goddess, but also very motherly and on her guard about those whom she loved. This intense warrior side came in handy when she found her father in danger of the god Apep, who was his largest enemy. Ra’s followers tried everything they could to protect him, but in the end it was his daughter Bast who killed Apep within the darkest hour of the night with her all-seeing cat eyes, that shone as brightly as the moon itself. Do what Bas would want you to do and party it up! Stop the stress, and know that your true essence is perfect. So, turn up your music, spray on your perfume, and wear the prettiest thing in your closet (preferably red if you have it). You can also burn some of Bast’s herbs in her honor, and don’t forget to ask her to dance with you. Don’t be afraid to add luxury to your life in whatever form you want. You deserve it. Always remember that if you feel you need a “you” day, be sure to take advantage of it. Those days are vital to you and those around you, as well as part of the road to enlightenment. Sometimes you need to spend some time with yourself to get a better hold on whats going on in your life. Bast would urge this, and would be willing to protect you if a moment of crisis strikes.